Expose your children to Halloween books where children are smiling and enjoying costumes. Let your children know Halloween is fun and exciting rather than scary. Before Halloween, allow your children to dress up in costumes and role play the trick or treat experience with peers, pets or even stuffed animals. This reinforces the association that trick or treat is a positive event and a fun time. Talk about what is real and not real to decrease anxiety and fear. Also, begin exposing your children to the Halloween decorations early in the month. Let them play with the ghosts, goblins, witches, and Jack-o-Lanterns to familiarize your children with the faces and objects. Even with lots of preparation, you still may be faced with a scared child. So have open conversations about Halloween and never punish your children for being scared. Lastly, please be considerate of all the children you encounter on Halloween night. If a child doesn’t say a “trick or treat” he/she may be non-verbal. Children grabbing more than one piece of candy may have difficulty with fine motor skills, visual processing, or impulse control. The child who takes a long time to pick out a piece of candy may have trouble motor planning. The child who looks disappointed may have an allergy. 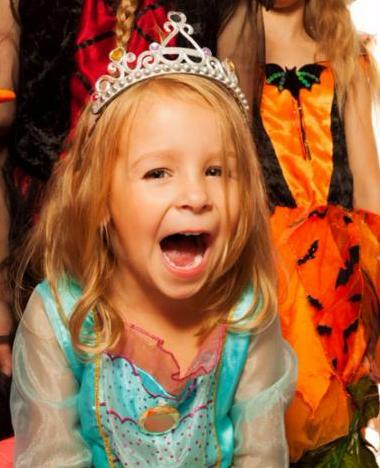 Finally, the child not wearing a costume may have a sensory issue. So be patient, it’s everyone’s Happy Halloween.